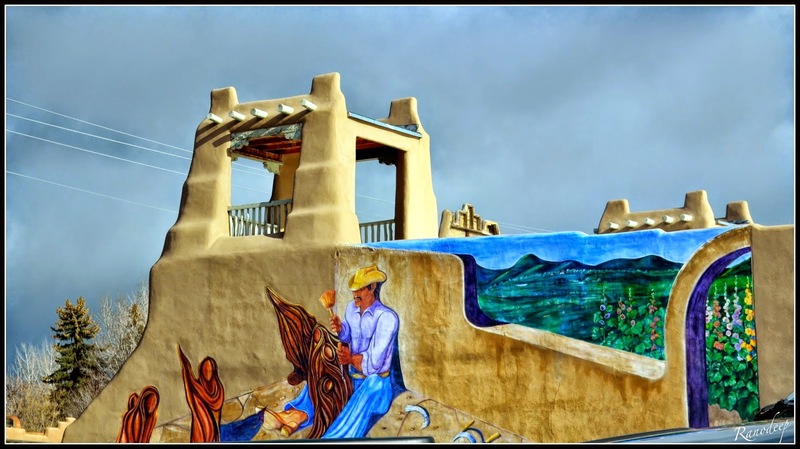 New Mexico, The Land Of Enchantments – Grab a cuppa, tell a story or listen to one. Being the neighboring state to Texas, all we needed was a car. We pulled up all the information Google could give us, roughly chalked out an itinerary and booked a car online. The next morning, we embarked upon our quest for the unseen and the pure joy of driving. 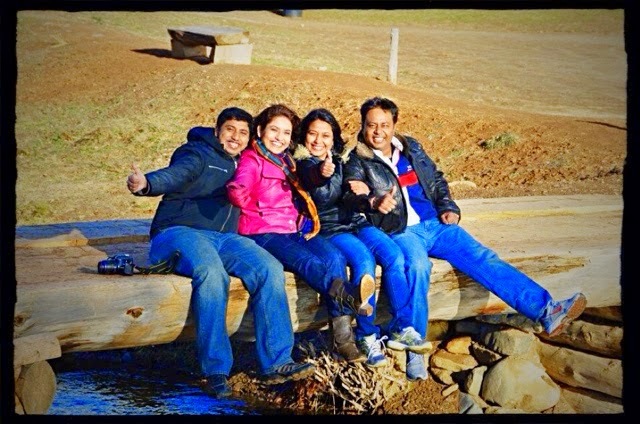 Three of the four of us were drivers and all of us loved road trips. We loaded up our car with food and gas and set off to cover 500 miles to Taos, NM before nightfall. We were hoping to catch a few snowcapped resorts for some snow adventures but the weather didn’t make it seem likely. We booked a hotel online for that night so we knew we would have a warm bed waiting. By the time we reached, it was pretty late and raining heavily. Deserted roads were alive only with the pitter-patter of rain. We went to sleep wishing for better weather. 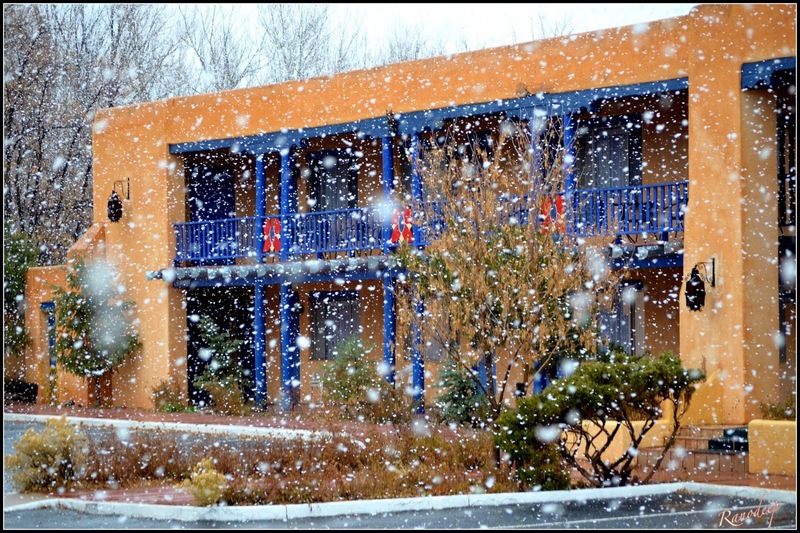 The morning surprised us with a very romantic snowfall. We walked around our hotel, mesmerized by the sheer beauty of a place that could have been in another century, an old civilization. We lazily walked to the dining hall to be greeted by a lavish breakfast, with a variety of local delicacies made to order, sitting and marveling the high ceilings and snowfall outside through the panoramic large windows. 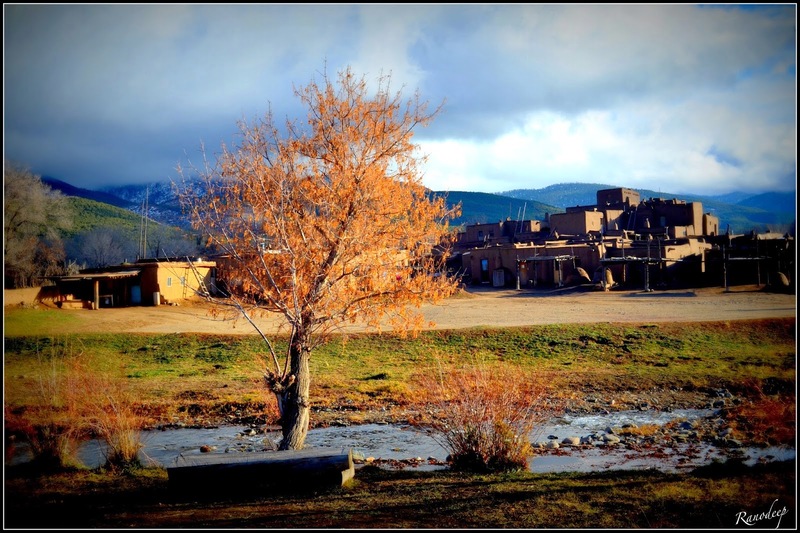 We fell in love with the place and decided to explore Taos and stay the night at the same hotel. This was our lazy vacation. We pulled up our boots to explore the wonders of the place. 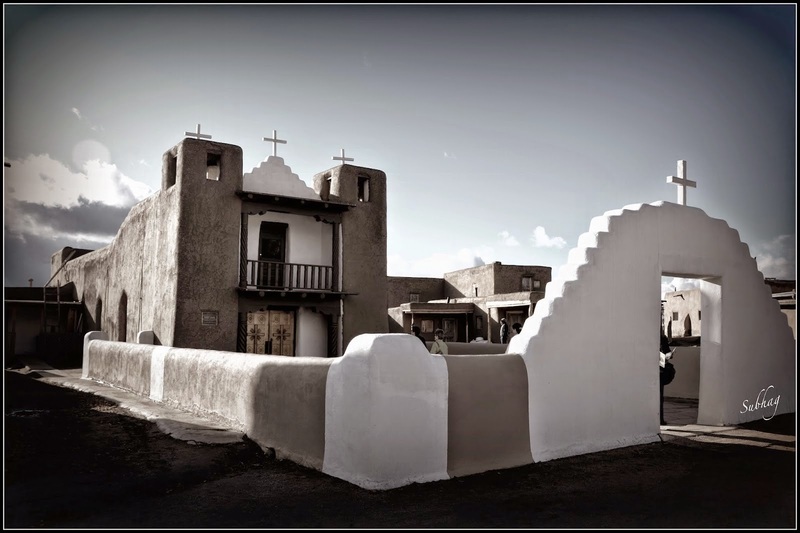 In about 4 miles, was the San Francisco de Asis Mission Church. It’s said to be “one of the most photographed and painted churches in the world”, and now we knew why! 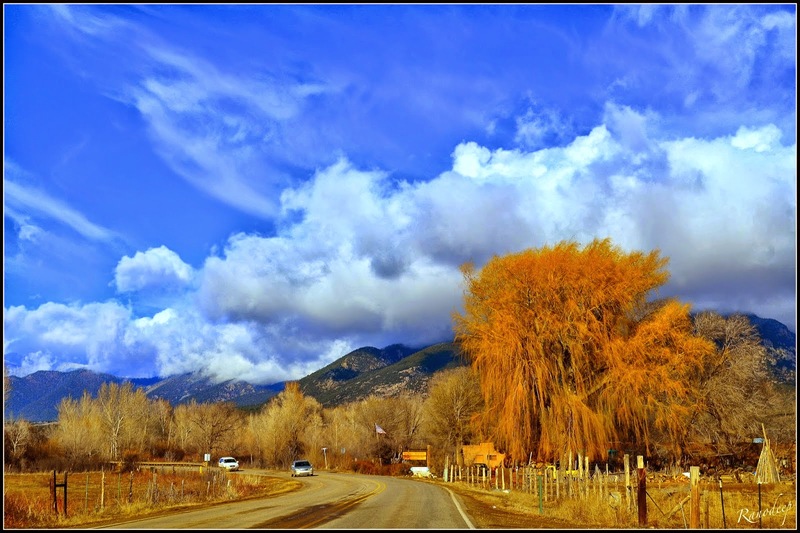 The drive enroute to the Taos Peublo World Heritage site was extremely scenic. These hand painted murals on the way caught our attention. Bright and colorful. Just like the state itself. 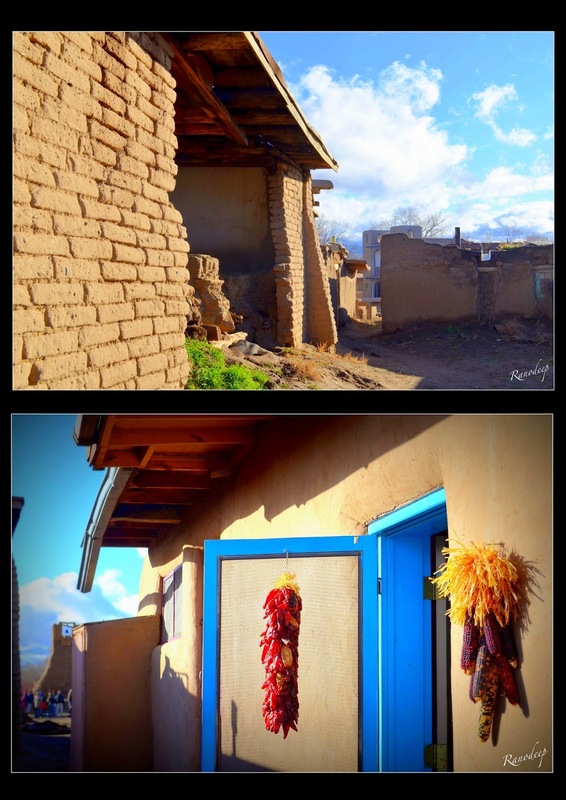 Pueblos are communities of the Native Americans usually found in the south western states of USA. 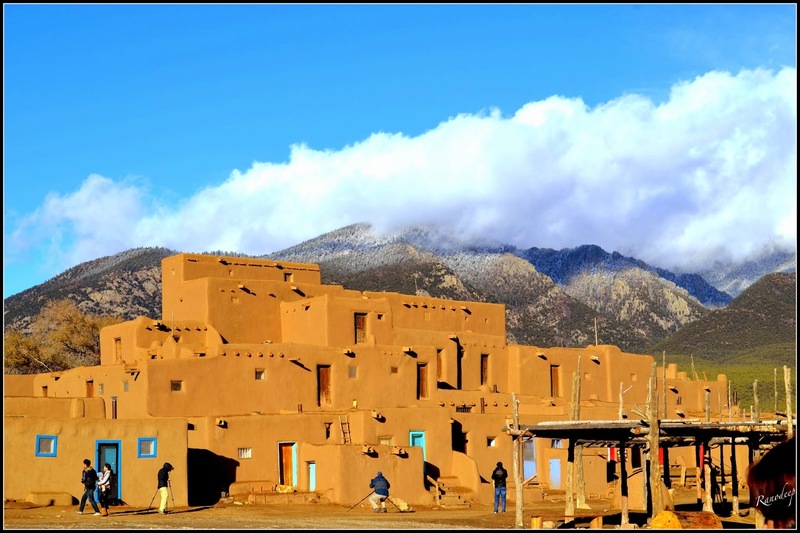 The pueblos, we visited are considered to be one of the oldest continuously inhabited communities in the United States. The next few pictures taken in color and black white was our attempt to capture the site in different shades and perspectives. Our perspective from behind the lenses. 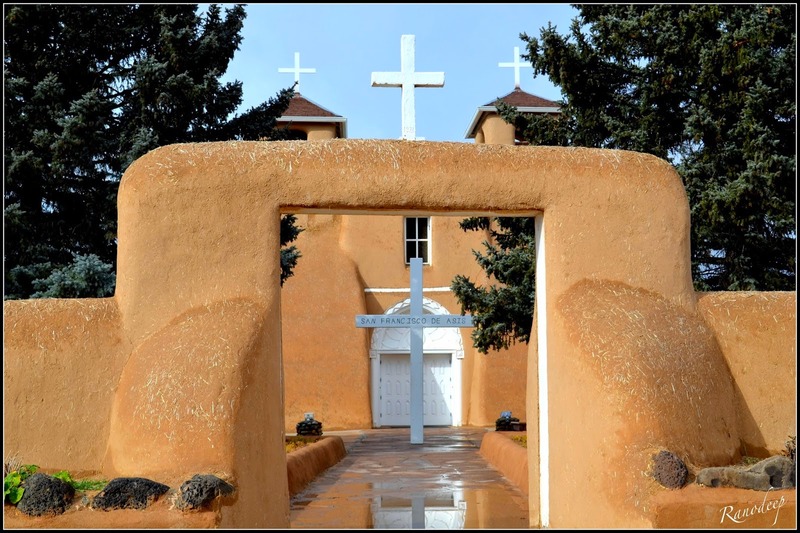 The settlement was built between 1000 and 1450 CE, on either side of Rio Pueblo de Taos, also called Rio Pueblo and Red Willow Creek, a small stream that flows through the middle of the pueblo compound. It is a village of mud cottages. While some of them housed little curio shops, many of them fashioned artifacts of old beliefs or decorative pieces. 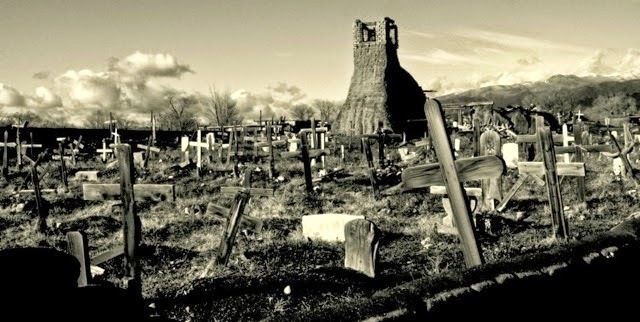 Set against the backdrop of a beautiful mountain range, little bridges criss-crossing the Red Willow Creek, graveyards with tons of history, the old churches, the boxed houses and the people, successfully make the place a land of enchantments. 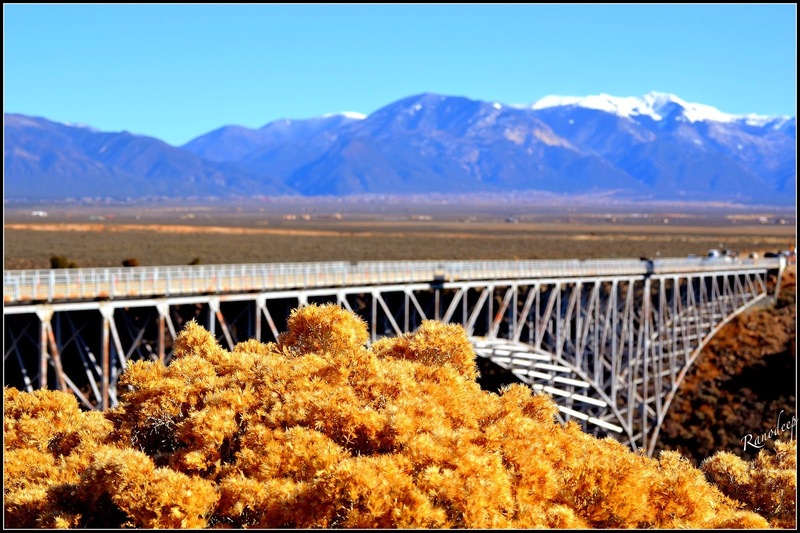 The Rio Grande Gorge Bridge was our next stop.The picture below says it all. GORGEOUS! 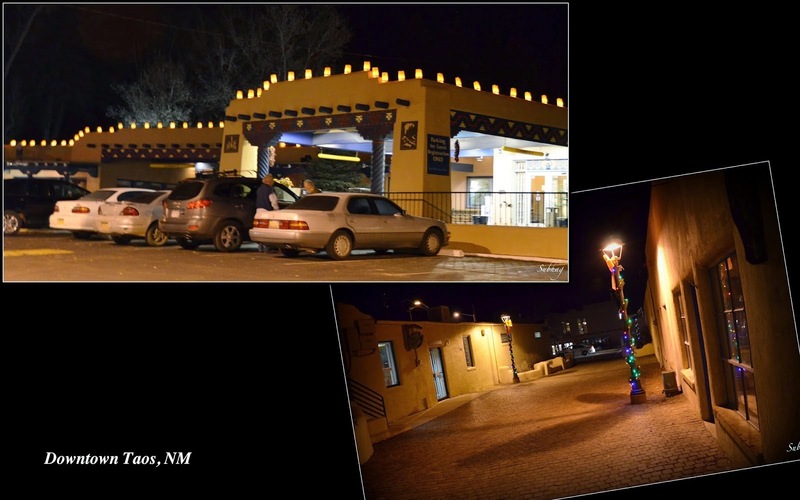 After a fulfilled day, we went on to explore the night life of Taos downtown. Since this was a month before Christmas, we got to see the ‘Luminaria’ or ‘Farolito’. The quiet town was beautifully decorated with thousands and thousands of small paper lanterns and lights, lined up in rows on buildings, roadsides and lawns to create beautiful patterns. Farolitos are candles set inside paper bags containing sand. It was truly a sight to behold! A delicious dinner at a local diner was a cherry on the cake that day . Relaxed after a good night’s sleep, the next day we bade good bye to Taos and started south. After 2.5 hours we reached Sandia Peak. 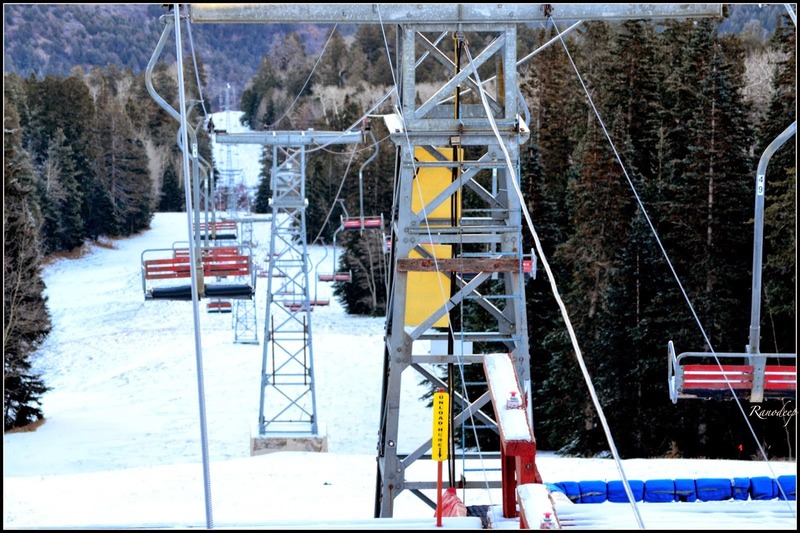 Sandia Peak Tramway has the world’s third longest single span. It is North America’s longest aerial tram. A lovely sunset on the city of Albuquerque below was a serene highlight. 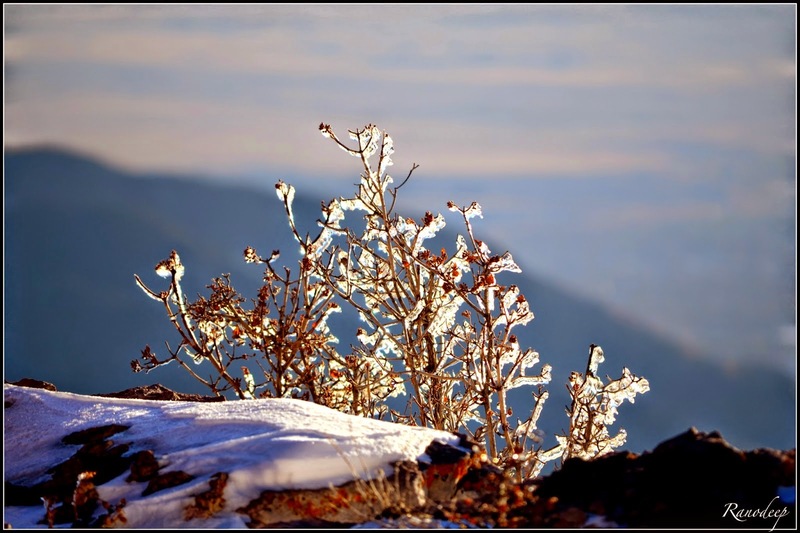 Frozen shrubs against the sunset. At the top of Sandia Peak. After covering 300+ miles since morning, we stayed the night at a little town called Alamogordo, near the White Sands National Monument. 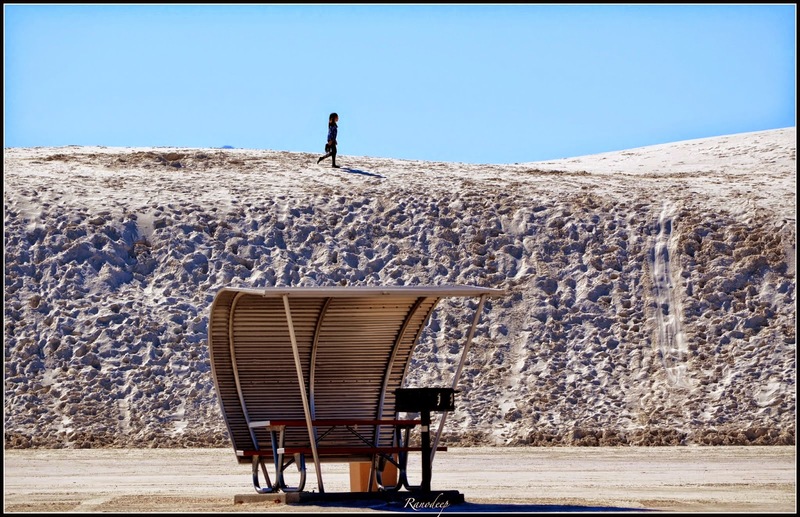 The next morning was another adventure of its own kind, as we drove into the white land of gypsum. 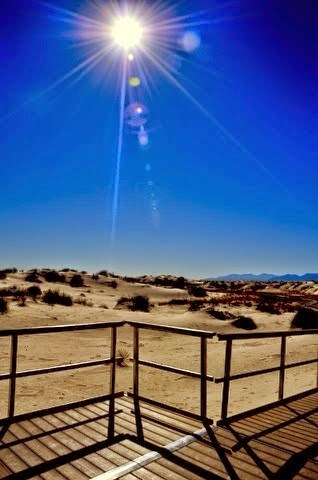 Miles and miles of white glistening sand lay around us in hills, waves and dunes, cool and comfortable beneath our feet. Desert vegetation dotted the land. There were artistically constructed pathways for bikers, wheelchairs and strollers, to preserve the flora and fauna but also welcoming all. 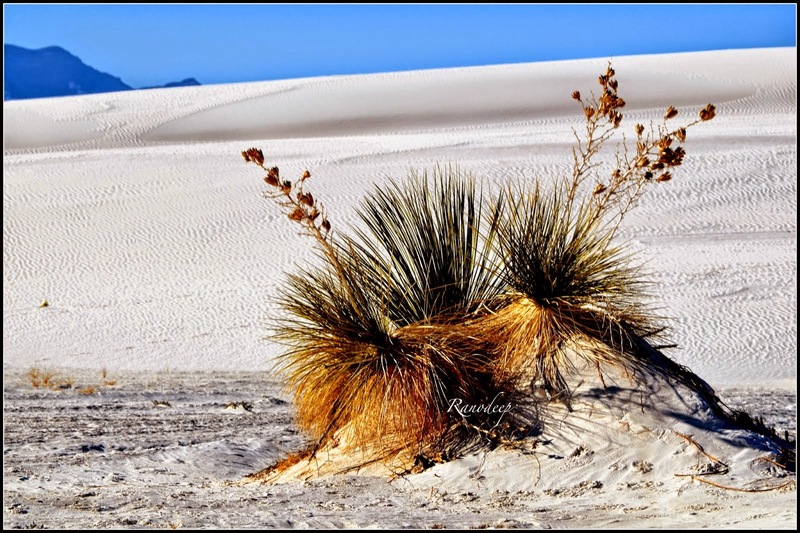 The White Sands National Monument is in the Tularosa Basin. 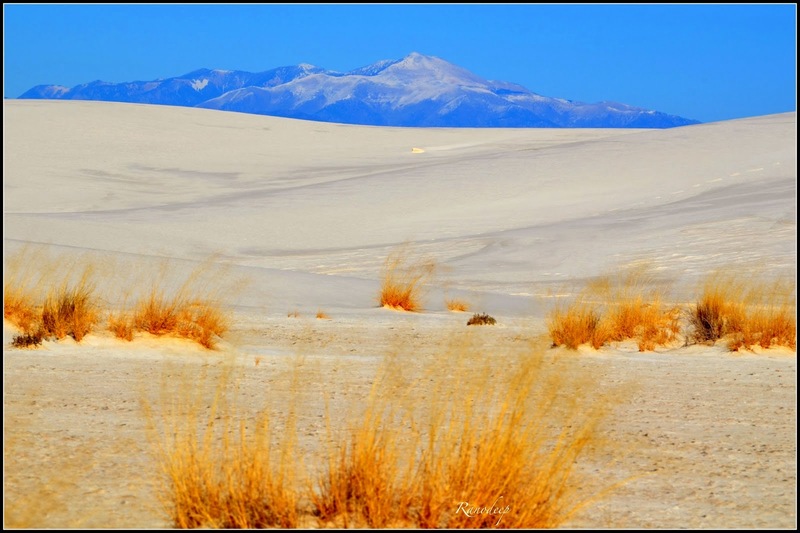 Surrounded by mountains , it is a field of white sand dunes composed of gypsum crystals. 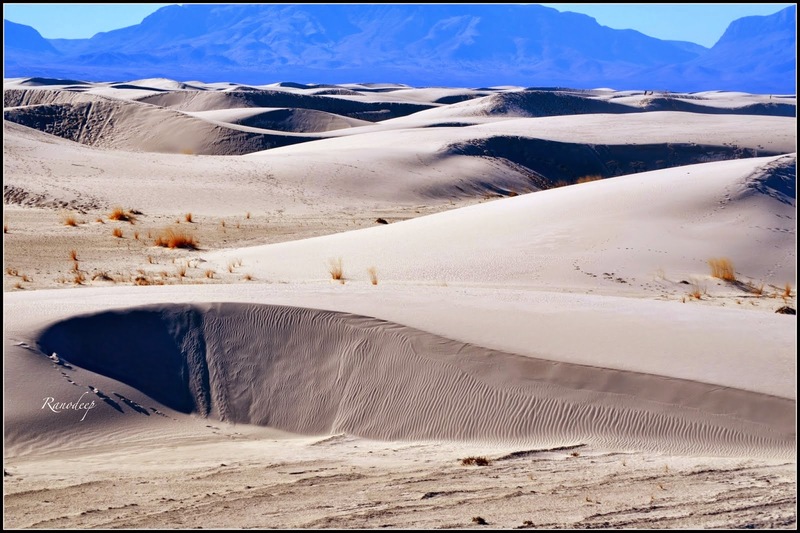 It is the largest gypsum dune field in the world. We saw little kids sandboarding on the dunes. We rolled, slid and ran on the waves. We laughed and clicked and giggled in the sands and made little castles and tunnels. After an exhilarating time, we drove home overnight for 600 miles. 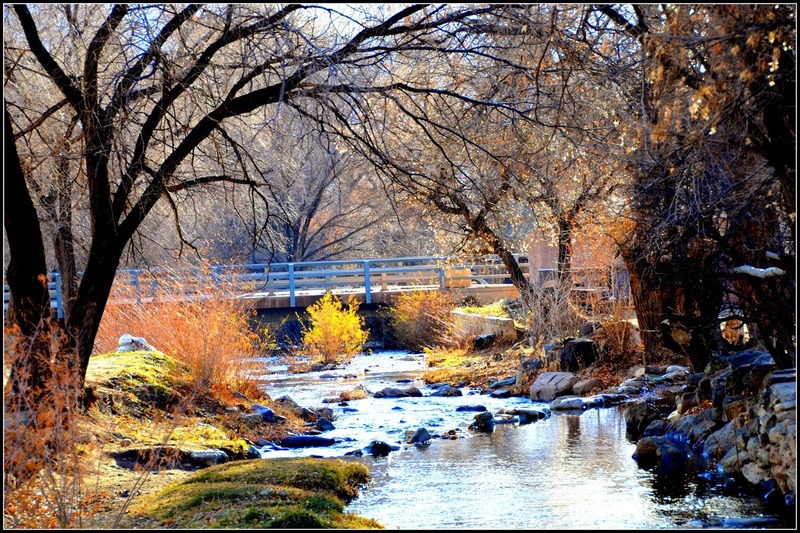 Beautiful moments and new found friendships wove their own brand of magic, a treasure we hold ever since our visit to New Mexico, the land of enchantments. Here we are, the travel enthusiasts, who travelled well over 1400 miles over a 4 day weekend and made a lifetime worth of memories. Got a travel story ? Email us at chatoveracuppa@gmail.com and get published under our Travel Friday section.